In addition to the many stalls that are laden with plenty of food, curios, clothing and jewellery there will also be a world of other attractions. Art galleries will open and exhibit the work of numerous local artists; ranging from sculptures to paintings and drawings. Venues around the town will open their doors to the public; hosting dancing performances, dramatic interpretations, comedic pieces and more. The Afrikaans culture is famous for its excellent food, and the Klein Karoo is a popular wine making region. This makes the KKNK the ideal platform on which to enjoy some of the most delicious flavours that are being created within South Africa. There are plenty of activities for the little ones too. In addition to various musical shows, there are also puppet shows, face painting stalls, and storytelling hubs. 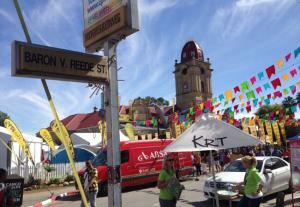 The KKNK continues to be one of South Africa’s most popular and best-supported annual events, and has been dubbed the king of local arts festivals. The gates open at 09h00 and close at 20h00.